This is the Baseline luggage set by Briggs and Riley. Briggs and Riley have been under the parent company U.S. Luggage LLC but have only been in the marketplace since 2006 and since that time they have grown to become one of the best known luggage brands among top tier luggage. The Baseline luggage set is a staple of their catalog and one of the best you could consider when looking for new luggage to acquire. They are extremely innovative and design their high quality luggage with practical features that are used on every trip and back that up with an extremely appealing guarantee. Read on below to get a better understanding of what exactly the Briggs and Riley Baseline luggage set has to offer and see if it’s the right set for you. If you want a condensed version or just the bullet points, read on below to the rating to see what we find is good and bad with this luggage set. 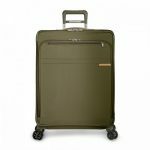 This Briggs and Riley Baseline luggage set only comes in two color options to choose from, black and olive, however, you can get different colors for these pieces if you purchase them individually. 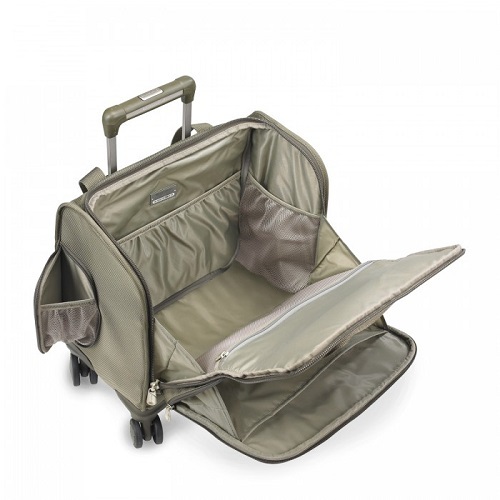 For example the large expandable spinner and the international carry-on are also available in navy. The cabin spinner however is not offered in navy, just the black or olive. The three piece Baseline is a great set to invest in if you have the coin to drop on it. If it’s a little outside your price range then there is always the option to purchase the pieces individually, although they still cost a pretty penny. Let’s take a look at how much this luggage set can actually pack. The luggage set is made mostly out of nylon with the spinner and carry-on being comprised of 95% nylon, 3% aluminum and 2% rubber, while the cabin spinner is made of 100% nylon. The frame is made of fiberglass which helps make this luggage set much more lightweight than it would have been, however, it seems average if not a little heavier than what you would want. The design of this 3 piece luggage set is very traditional and straightforward. To some people they would consider that to be boring and wonder why you would pay so much money for a set like this but sometimes less is more and Briggs and Riley is one of the best in the business for creating excellent looking luggage that will last a lifetime. The overall style and design of the Baseline luggage set is exactly what you would expect from Briggs and Riley. There aren’t many colors to choose from as they tend to stick with neutral colors but the composition of the luggage is excellent. With a luggage set like this, you don’t expect to pick crazy colors, so black and olive are fine and I’m not worried there aren’t other options. Taking it all into consideration, I give the style of the Briggs and Riley Baseline 5 out of 5 stars. If you’re reading over this review and considering purchasing this Briggs and Riley Baseline luggage set then you already know two things; one, it definitely isn’t a cheap piece or set of luggage to purchase and two, for that price it better provide excellent durability to last you a lifetime. And of course Briggs and Riley deliver. The outside of the luggage set is made of a very durable ballistic nylon which is great as a resistant to moisture, dirt, wear and abrasions. Each of the larger pieces of luggage actually have corner guards on them as well to provide additional protection while you are rolling your luggage through the airport. Trust us, corner guards are amazing as they absolutely prolong the life of your luggage. The next step Briggs and Riley took with their Baseline collection was to use lightweight materials that are extremely sturdy to reduce the overall weight and therefore stress, your luggage handles will have to endure. They did this by constructing the frame out of fiberglass which again is much more lightweight than other alternatives and provides a flexible yet extremely durable base for the luggage set. Briggs and Riley are known for being an excellent company that makes high end luggage that is superior in its quality. One of the features that makes luggage great is being able to quickly and easily fix something when you are on the road and not able to send it in for repair. This luggage set offers you the ability to quickly change the wheels for easy replacement while you’re on the go so you don’t get stuck travelling with any broken wheels. Also the zippers are easily replaceable that will help prolong the life of your bag. 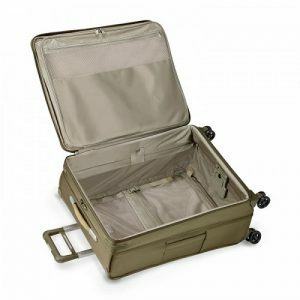 Briggs and Riley are an excellent company to consider when you are looking for your next luggage set and the Baseline luggage set it one of the best you could consider. Although a bit pricey they are excellent. Briggs and Riley offer a “Simple As That” lifetime warranty that covers even airline damage which more than makes up for the price you’ll pay as you’ll never have to buy another piece of luggage again. They will quickly and free of charge fix your luggage should it break down in any way. There are no downfalls that I have been able to uncover when it comes to this luggage set as any compromises with the luggage are quickly taken care of by this incredible warranty. For these reasons the durability for the Baseline luggage set gets 5 out of 5 stars! Briggs and Riley luggage usually contain some interesting functionality and the Baseline collection is no exception. 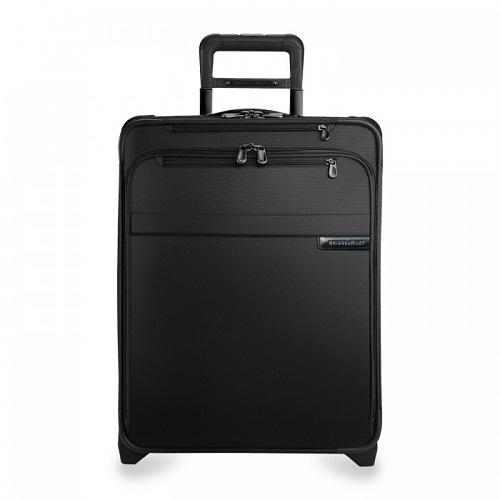 Most of the functionality across the two upright pieces are exactly the same and the cabin spinner is obviously a little different seeing as it’s not a suitcase but more of a duffel. The large Briggs and Riley Baseline Spinner as well as the international carry-on have a number of standard features as well as a couple that are exceptional and innovative. Some features that may be considered standard at this point in luggage innovation include zipper closures that are excellent, sturdy and feature easily changeable zipper pulls. The four spinner wheels are also considered commonplace by today’s standards. The four spinner wheels are extremely durable and swivel with ease. 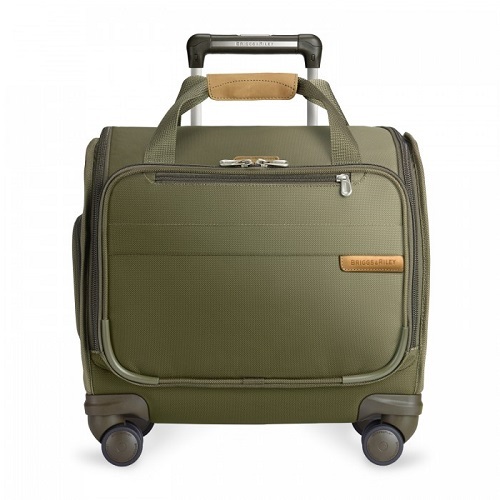 It is truly effortless navigating with this large suitcase as the wheels provide 360 degree turning radius. Again if you run into any issues with the wheels they are also easily interchangeable. Some of the newer and more innovative changes made to this luggage collection by Briggs and Riley are from a combination of testing out what works best and listening to feedback that they get from their customers. A perfect example of this is how they redesigned the suitcase to have what they call the outsider handle. The outsider handle is an excellent design decision on Briggs and Riley’s part and I’m actually surprised it took so long for a company to do this, especially when it seemed so blatantly obvious. The concept is that when the suitcase is flat and open for packing, the handle has been traditionally built into the suitcase so you have two bars going down the back of the suitcase and the clothes you would pack would wrinkle. Well this is no longer the case as the handle is on the outside and the inside of the suitcase is completely flat! This achieves a couple of things, for starters it means that you can fold your clothes and lay them in your suitcase flat which will cause much less wrinkling. The second benefit of such a design is an increase in capacity in the amount of clothes you can pack. And a third benefit is quick access storage in between the handles on the outside of the bag! Another feature that Briggs and Riley improved on was the expandable aspect of the suitcases. They call it their CX expansion-compression system which increases packing capacity by expanding the suitcase and then also allowing you to compress it back to its original size so you can easily store your luggage. All of this is done with a simple button on the inside of the suitcase. The cabin spinner is not without its features either. This smaller piece of luggage is perfect for your additional personal bag when flying, which can easily fit under the seat in front of you. It also comes with a tablet sleeve in the front pocket for your own personal inflight entertainment. Finally a built in suiter keeps your more important clothes like suits and dresses wrinkle-free. It’s like having a garment bag built right into your large suitcase which comes in handy if you are planning on going to anything formal or if you are travelling for work. Taking all of these features into account, the Briggs and Riley three piece Baseline luggage set gets 5 out of 5 stars! The Briggs and Riley Baseline luggage set is a great looking luggage set that also works great and designed to last you for as long as you want them around. Although there are not many colors to choose from, Briggs and Riley easily make up for it with incredible durability and functionality and that just might be worth the price tag. 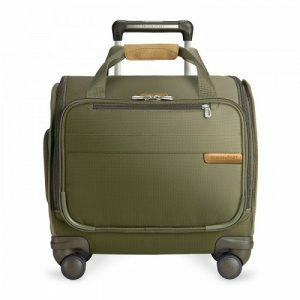 Let’s take a quick summarized look at what we liked and didn’t like about the Briggs and Riley Baseline luggage set. Fiberglass frame will cut down on the overall weight of the luggage set, while also implementing materials to make it durable, including nylon, rubber and aluminum. It has lasting durability with the ballistic nylon which is resistant to moisture, dirt, abrasions and general wear and tear. Strong and sturdy handles, zipper pulls and wheels. In case any damage comes to the zipper pulls or wheels they are easily changeable while you’re on the go. Four spinner wheels provide you with 360 degree effortless rotation that makes maneuvering in the airport so much easier. Capable of either pushing or pulling the luggage set to meet your maximum comfortability. 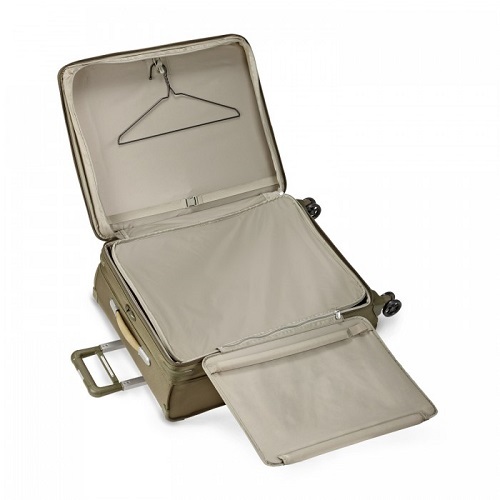 The outsider handle places the handle of the suitcase on the outside so that the inside is flat to provide wrinkle free storing of clothes and increased capacity. It also provides external quick access pockets around the handle so you can grab papers quickly while going through security. Expandability of the luggage is becoming more and more common but Briggs and Riley made it even simpler with simple push button technology. 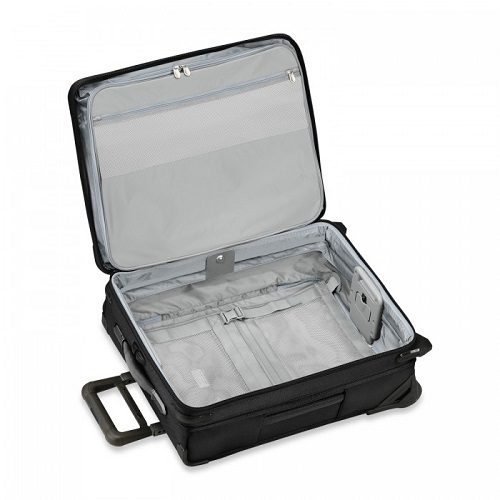 Quickly expand to increase your loading capacity or compress for quick and easy storage of your travel gear. 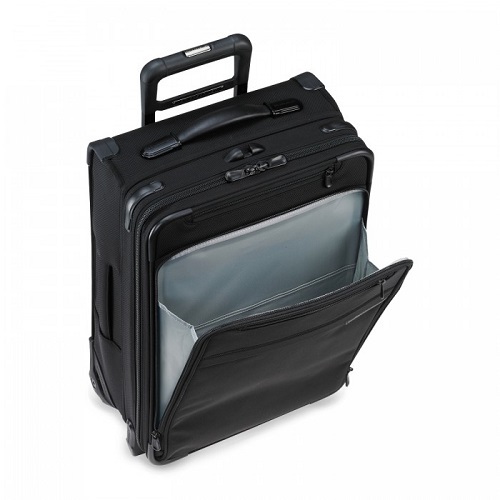 Garment bag functionality in the large expandable suitcase will keep you ready for a formal appearance anytime you’re on the road. The cabin spinner, meant to go under the seat in front of you, provides you with an easy tablet pocket so you’re never more than a few seconds away from your own personal inflight entertainment. Briggs and Riley’s “Simple as That” warranty provides you with lifetime reassurance that your travel gear will always be covered and ready to go for your next trip. 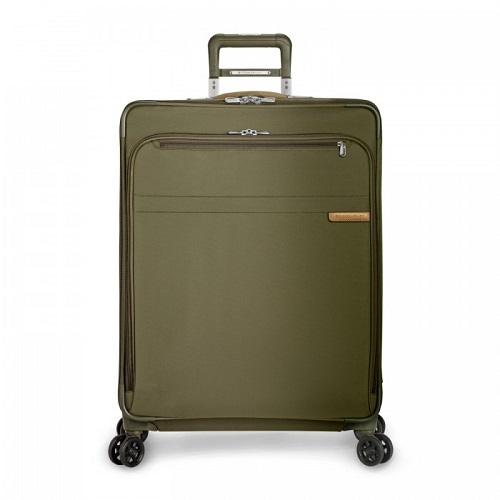 Although not really a big pitfall and most people looking at Briggs and Riley luggage will be happy with the choices of colors, they do only offer this set in two colors to choose from, Olive and Black. Not a big issue but one that will disappoint a very few amount of people. The weights of the individual pieces of luggage are not heavy but are not light either. If you’re worried about packing so much that you go over the weight limit for luggage then you may want to look for a lightweight luggage set instead of the Briggs and Riley Baseline set. Finally the biggest downside of this luggage set is going to be the overall price of the luggage. This is not cheap by any means but if you’re reading this review it’s because you know that Briggs and Riley offers some of the best luggage in the business. Briggs and Riley is a top notch luggage brand and one that is best suited for business professionals and those with plenty of money to spend on luggage. It’s not for anyone looking for a budget set like college students or most typical travelers. The style, durability and features of this luggage set are incredible and definitely make it worth the price especially with the lifetime warranty but the price is the biggest pitfall of this set and therefor I have to give the Baseline luggage set 4.5 out of 5 stars.